Is it safe to use a gas grill in the rain? What about a charcoal grill? Yes, it is! You can use either of these grills in the rain, if you know what you’re doing. In fact, people have grilled their food with fire outdoors for centuries, even prior to the grill. 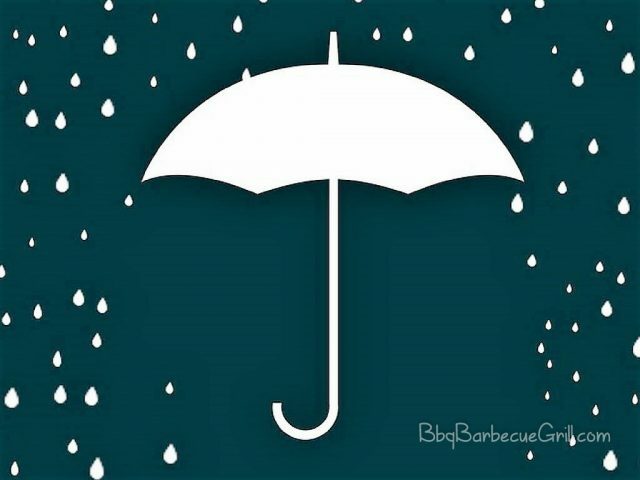 Learning to take care of your grill and use it in the rain is an exciting experience, and your friends and family will love enjoying the fruits of your labor year-round. By the way, if you’re wondering it if is safe to use a gas grill indoors – the answer is almost always “never” – you need the gas grill connected to the line or propane, and this can cause a hazard indoors. Keep your grills where they belong, away from the home as far as possible. Don’t keep your propane tanks in the garage unless you have disconnected the propane tank completely. You can store both a gas and charcoal grill inside your garage but they must be fuel-free when you do this. Clean a charcoal grill completely and store the gas grill only when the fuel is not connected. Is it safe to use a gas grill indoors? Not really. And never, ever try to use a charcoal grill indoors. Building a shelter for your grill may be in order if you’re in a region where there’s a heavy rain season. What’s better than learning to barbecue in any weather, anyway? The first thing you’re going to want to think about is grill shelter plans. Grill shelter DIY may sound easy, but there are different ideas you will probably want to explore. After all, you may want to add components such as a wind shield for your grill. Most grill shelters that people build on their own are made from wood and involve intricate plans. Some of them are just basic structures that house the grill and give enough space to move around, while other models for grill shelter have amazing designs reminiscent of an island bar. It’s all about what you have the time and skills to actually make. 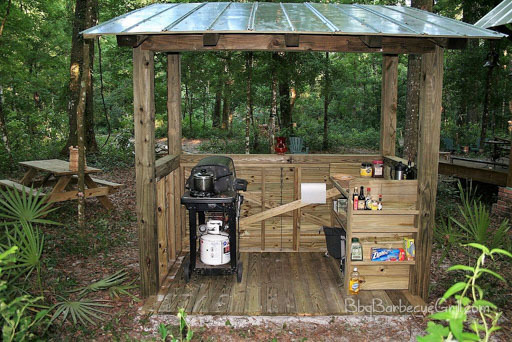 Pinterest has a great collection of outdoor grill shelter plans from across the internet. Making your own grill structure may be a great project for a group of friends, but not all of us are engineers or carpenters. For those of us who are not so handy, there are other options out there that we can invest in. A grill umbrella is usually pretty heat resistant and stands tall, far enough from the grill surface that you probably won’t be exposing the umbrella to heat, anyway. The umbrella over grill idea has been used by hot dog vendors at the beach for decades. While it won’t work in hurricane or tornado weather, it’s perfect for beachy days with light rainfall. 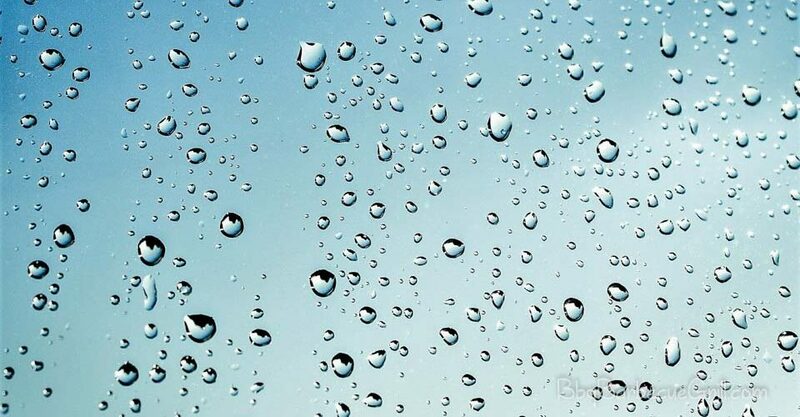 With rain often comes wind, which can be a fire hazard and also an obstacle to your cooking. Wind slows down barbecues and can cause gas grills to even need to be re-ignited. This is why a wind shield is recommended if you’re going to grill outdoors in bad weather. If you can’t grill outside for more than a few minutes, it’s okay to take shortcuts. Some people like to cook their meat in the oven for about 5 minutes to warm it up, and then throw it on the grill to grill and sear. Other shortcuts can include precooked shrimp, store-bought hot dogs and store-bought turkey and hamburgers that the store has already seasoned for you. When the food hits the grill, it will still have the flavor you’re seeking; it’s luscious, juicy, and flavorful and gives you that taste that only a grill can provide. Yummy! Grilling outdoors can be its own adventure and you may think it’s pretty tricky when you first start. But once you’ve worked with it for a while, checking the charcoal and setting up your grill in poor weather will start to feel like a second nature. 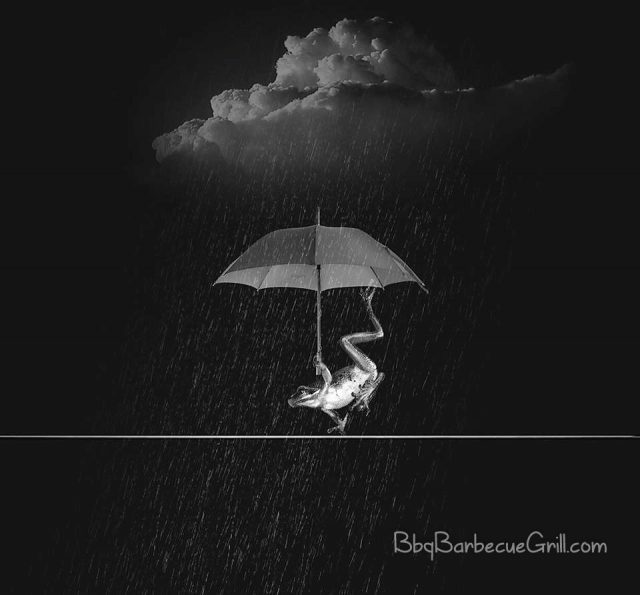 Weather is often unpredictable so considering taking a grill umbrella and a grill wind shield with you if you want to grill on vacation. That way, you’ll never be unprepared for whatever life brings your way. Be prepared, but always take the opportunity to grill outdoors in good weather, too! There’s nothing like grilling in the great outdoors. ← What’s the Best Weber Electric Grill on the Market in 2018-2019?